Claude lost his battle with leukemia on June 2, 2001. His music will remain in the heart of his family, and all who knew him. Dave Lewis had a number of groups under his name and leadership... Dave Lewis Combo, Dave Lewis Trio, The Five Checks and more. The above are only some of the musicians who performed with him. I was just searching for an old friend, Dave Lewis, and came upon your site. I met Dave at Meany Jr. High in 1951. 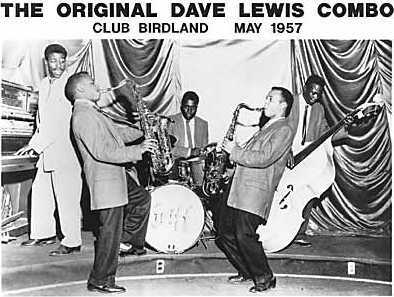 We became good friends and when he got his first job at Birdland, possibly in 1953, he invited me to come hear them play. They were terrific. I would do a little rap on the alley door which was right next to the bandstand and one of them would let me in. I remember Ronnie Height was in the first Dave Lewis Combo. I moved to California in 1956 and when I returned in 1958 they told me Ronnie had moved to Los Angeles to write music. The last time I saw Dave perform was probably 1966 at the Owl Tavern. The last time I saw J.B. was in the early 70's. He had joined the Merchant Marines and was doing very well. I met Barney in 1949. We both had a Seattle Post Intelligencer (P.I.) paper route and we worked out of the same paper shack. One of my favorite memories is of a Sunday morning argument when he came out on top of one the older boys. Does anybody know where these people are?. We were good friends and it would be great to talk about old times and share how we have managed to get this old. I watched Dave Lewis perform at Dave's fifth Avenue, and DJ's. I believe I saw him first at the "Downbeat" in Seattle on a revolving stage. I would drive from Tacoma to Seattle every Saturday night to watch his group perform. There has never been a sound like the "Dave Lewis Sound". I have been trying to find old Dave Lewis vinyl's. I got a good copy of "little Green Thing" album and converted to a CD. Wow! George Griffin moved to California in 1970. After 36 years in California, he moved back to Seattle in August 2006. While in California, Griffin recorded with many artists at the Gold Star Studios. He had one of the top Sports Commercials in Los Angeles, the Big Joe MacDonald Theme. He played and sang on many movie sound tracks... 10 to Midnight, a Charles Bronson movie, "Abby"/"God Told ME To". He became a legend in Long Beach, CA at clubs dates, R&B and jazz concerts. He also did a tribute to Otis Redding in Maui and California. George toured Holland at the Blues Festival with The Elliott Chaver Band. The list goes on and on... TV commercials and Mad TV. All this started after the Dave Lewis Combo. He is one of Seattle's music pioneers. For more information, write to him at 33rd Avenue South, #629, Seattle, WA 98144 or call 206-721-5261. I had the supreme pleasure of sharing the stage with Dave Lewis & Ron Holden at the Children's Orthopedic Hospital Benefit in 1981. We, Sparky and the Starfires, were the backup band for The Coasters w/Bobby Nunn, and opened with a 30 minute set of our own. As the evening progressed Dave Lewis took the stage performing on that ineffable Hammond B-3... and I mean he "took" that stage. Man was that a gas. Dave and his group were absolutely flawless. I felt so blessed to be a part of that lineup of musicians. It is one of my fondest memories as a Northwest musician. In the summer of 1964, Dave Lewis, with the other two members of his trio, Joe Johanson, guitar, and Dickie Enfield, drums, left The Black & Tan to go to work at Dave's Fifth Avenue Club on 5th Ave. just off Denny Way. At that time, Mike Mandel got the gig at The Black & Tan. Mike was, and is an incredible keyboard player. At the time he was playing Hammond B-3 with 1 Leslie speaker (he later had 2 Leslies) fashioned after combined styles of Jimmy Smith, Jimmy McGriff, Brother Jack McDuff, John Patton, etc. Mike was a big part of the Seattle jazz scene at the time and a member of The Seattle Jazz Society for whom he played many functions other than his gig at The Black & Tan. Mike was good friends with Don Stevenson/drummer & Lee Parker/guitar (both had been part of the Seattle R&B scene for several years) so he hired them to gig at the Black & Tan. Mike Mandel fronted the group until Don Stevenson left to go south to San Francisco. At that time, George Griffin, drummer extraordinaire, joined the group. With George's vocals and stage presence, he became the front man, and the organ trio became The George Griffin Trio. George had just come off the road with Lionel Hampton. He was with "Hamp" 18 months. Hamp called him "Little Hamp". David passed away on March 13, 1998 at a hospital in San Diego from lung cancer. Dave's youngest daughter lives in Renton. His twin sister and mother reside in Seattle and his brother lives in Bellevue.